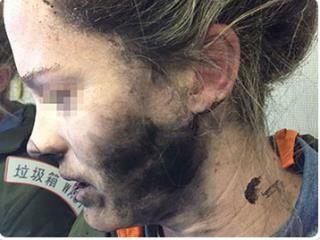 (Newser) – A flight from Beijing to Melbourne, Australia, turned terrifying last month when a woman's headphones exploded midflight, burning her hands, face, and hair, the Sydney Morning Herald reports. The unidentified woman had dozed off a couple of hours into the Feb. 19 flight while wearing the headphones, and per an Australian Transport Safety Bureau warning issued about the incident, she awoke to a loud bang and a burning sensation on her face. She was able to gather her wits, grab the headphones, and hurl them to the floor, where she says they were "sparking" and "had small amounts of fire." Flight attendants came running with a bucket of water to douse the device, part of which had melted and stuck to the floor of the plane. The ATSB release shows images of the woman's face and neck covered in black soot and with burns and blisters on her hand. Sounds par for the course, considering the electronics I have received from China from eBay. Me dad had a plastic lighter in his pocket and a 9 volt, it crossed a penny heated up and as blew a hole in the lighter but did not catch fire. Now don't they know that throwing a bucket of water on a planes floor will make the Elmers Glue come undone holding the plane together?